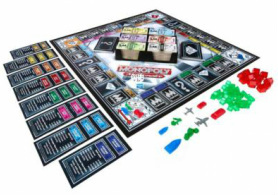 _Monopoly Millionaire, the game with just one aim - the first player to a million dollars in cash wins! It's all about the luxury lifestyle and finding the cash to fund it as you rush around the board in your basic start-up vehicles. Pick up Fortune cards and scoop up bonus properties for free. Upgrade your game piece and you collect more when you pass GO - swap your row boat for a yacht or your paper plane for a private jet! Luckily, there's also the Millionaire Lifestyle cards, for buying luxury properties and living the high life on Paradise Island or Party Plaza with your luxury limo, diamonds and big cash business deals. 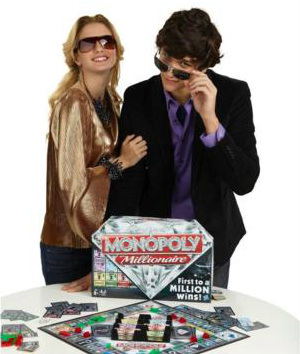 This new Monopoly will delight those fond of fame and fortune aged 8 and upwards with its bling look and 'get rich quick' scenario. And for those who love the original but don't have the time these days, this game is faster and has no nasty taxes in store - result! An absolute must-play board game for Christmas 2012 - buy your copy now!